Nowadays, wireless networks are become widespread and indispensable in everyday activities. Thanks to a variety of wireless communication technologies including Satellite-based communication, Global Positioning System (GPS), Mobile Cellular Networks, Radio Broadcasting Service, Wi-Fi networks, Bluetooth and all the others emerging short-range wireless communications standards, we are able to choose the technology that best suits our needs in terms of coverage and throughput and achieve almost ubiquitous connectivity in any environment, without resorting to fixed infrastructure and connections. In addition, the transition to the wireless enables new technologies and communication paradigms, previously simply unthinkable. This is the case of the Internet of Things (IoT), nowadays already counting billion of devices connected to the Internet and able to provide innovative services in a variety of scenarios, from Smart Health to Smart Transportation Systems. However, the shared nature of the wireless communication channel poses an increasing number of threats. In the wireless setting malicious entities can easily hide their presence and cause huge damages to the wireless communication infrastructure, with high chances of being unidentified. At the Cybersecurity lab we are on the front line in identifying weaknesses, spotting vulnerabilities, demonstrating attacks feasibility and identifying lightweight but effective solutions to strengthen the security level of the most used wireless communication technology. The research group tackles the hottest issues in wireless security such as authentication of wireless nodes and messages, access control, communications confidentiality, integrity of messages and protection against availability attacks, to name a few. Methods include both the use of cryptographic solutions, widely adopted and tested in classical computer networks applications, and the resort to innovative and lightweight security solutions able to overcome the limitations of the wireless communication technology without requiring high computational and bandwidth resources, usually unavailable or costly to achieve in the wireless context. The algorithms and solutions developed at the Cybersecurity lab are applied within a wide range of applications and scenarios, including Internet of Things, Wireless Sensor Networks, Mobile Area Networks, Vehicular Networks and Wireless Ad-Hoc Networks. 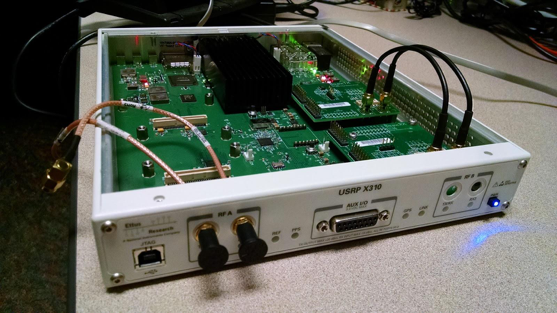 Figure 1: A USRP X310 Software Defined Radio, available at the Cybersecurity Lab for research and experimentation. The security of the solutions developed within the Cybersecurity lab is evaluated both from the theoretical perspective and from the experimental view, thanks to a wide set of forefront equipment that are available for experimentation to researchers and students, as the USRP X310 Software Defined Radio reported in the Figure 1.